Sugar cookies are a wonderful light tasting treat. They pair well with tea, coffee and for the kids, a big glass of milk. Ice them or leave them plain. The choice is yours. Play with fun cookie cutter shapes. There are hundreds of possibilities out there for you to explore! These sugar cookies, once cut and baked, will last for several weeks when stored in an air tight container. 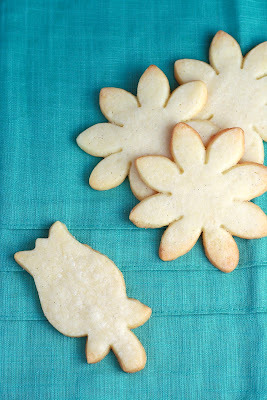 I usually ice my cookies with royal icing but I loved the simplicity of these flower cutouts. I used a dusting of icing sugar on my work surface as well as on top of the cookies before rolling out. It makes rolling 100% easier as it reduces sticking which tends to be the most difficult challenge when dealing with this type of dough because YES, it will stick to waxed paper too. What I really love though is how the icing sugar creates a shiny glaze on the baked cookies. Perfect for cookies that will be eaten as-is, fresh out of the oven. I added the scraping of one vanilla bean to the dough. I love the flavor it adds and also the small specks of vanilla really enhance the appearance. Making these cookies does take awhile because of the chilling phase required before baking so be prepared for playing a little bit of the waiting game. Also, do not OVERMIX! I cannot emphasize this enough. You do not need to cream together the butter and sugar as you would a cake because the longer you cream, the more tiny bubbles are created. Its these bubbles which give cakes height. The opposite of what you want. You want a thin and crispy cookie! Lastly, when rolling the dough do not go back and forth with the rolling pin. 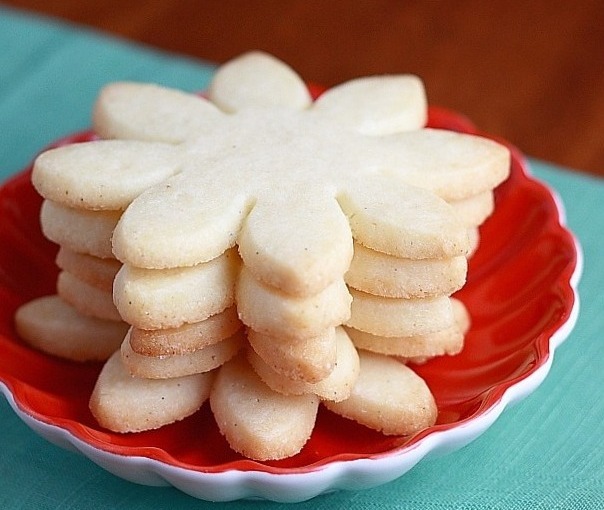 You can easily overwork the dough resulting in one tough cookie. To roll, simply place your rolling pin in the middle of the dough and roll outwards: forward motions from center outward and backward motions from center inward. Rotate the dough when needed to roll out the sides, again starting from the center at all times. IN LARGE BOWL, cream together butter and sugar on MED speed for no more than 1 minute. ALLOW to cool on baking sheet 5 minutes then gently remove with spatula and place on cooling rack. Leave plain or ice with royal icing. A great base cookie - a blank canvas - ready for decorating! These are SOOO cute and they look delicious! Love it!! It probably has something to do with the early hour in which I read this post but your description of rolling out the dough was very relaxing. It was like a meditation exercise (listen to the waves gently lapping up on the rocks and feel the tension move from the center to your body out through your fingertips and toes.) Seriously the dough rolling had the same effect. Who knew rolling cookies could be a zen. Thanks for the hints! And I love the shapes!